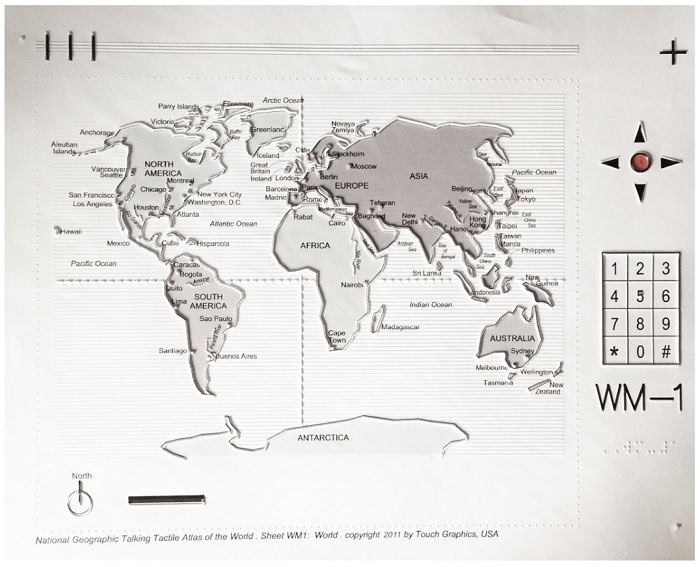 The National Geographic Talking Tactile Atlas of the World. A collection of 43 audio/tactile maps and accompanying software designed for the TTT. The Atlas allows individuals who cannot access printed material to explore maps and learn about the geopolitical world. Users place one of the raised line, textured and color printed map sheets on the TTT, and then press on various regions and points to hear human-voice identifications of each feature. A “main menu” is accessed by pressing tactile control icons on the side of the map sheet; this offers a range of tool options providing in-depth information, including historical timelines, interesting facts, language samples and a distance calculator. At the heart of the Atlas is the Index tool, which permits the user to scroll through an alphabetical listing of all places represented in the Atlas. The user can select a desired place name; then the system serves as an audio “coach”, guiding the user’s hand to the requested destination on the map. This is a crucial (and unprecedented) accommodation that enables individuals who may never have been confronted by a map before to independently locate places of interest to them. The Talking Tactile Atlas of the World has been created in collaboration with the staff of National Geographic Society Maps Division, which has supplied base maps and cartographic direction to the development team. User testing for the Atlas has been carried out at the Overbrook School for the Blind in Philadelphia, and at Baruch College CCVIP and the Jewish Guild for the Blind in New York City .